HomeThe Only Thing ‘Staggering’ About These Savings is the Audacity of Claiming They Are Staggering. The Only Thing ‘Staggering’ About These Savings is the Audacity of Claiming They Are Staggering. Cabinet Office Minister Francis Maude claims that the government has made ‘staggering’ savings of £3.75bn in the 10 months May 2010 to March 2011. So just how staggering, and credible, are these claims? Well, first let’s just compare them – that would be about £4.5bn a year for a full year. How does that compare to previous ‘efficiency’ campaigns in government? £7bn a year – The 2004-07 Gershon efficiency programme under Labour claimed to add about £7bn of efficiency savings each year, with a cumulative £21bn saving. £10bn a year – The Conservatives promised in their David James review, published around at the same time as Gershon, that they could save £10bn a year – £30bn cumulatively. £10bn a year – The 2007 Comprehensive Spending Review promised to deliver about £10bn a year. To be fair, I put these figures to the Cabinet Office on Friday and their rather pathetic response was that this isn’t comparable because it doesn’t cover the whole of government spending, just the savings programmes for which the Cabinet Office is responsible across government. So much for transparency – publishing non-comparable figures with programmes run by the previous government from 2004-2010 and claiming they are “staggering” only stands up if they can be shown to be so much better than what went before. 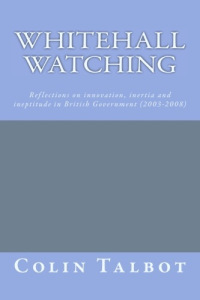 Having studied various government efficiency programmes – dating back to the Rayner Efficiency scrutinies under Thatcher in the early 1980s – one fact stands out above all: whatever they initially claim to have saved always turns out to be far from certain under closer inspection. As a rough rule of thumb, just halve whatever they’ve claimed and you are probably in the right ball-park. Interestingly the Press Release for the latest claims says that these have been “independently audited” but I couldn’t get out of Cabinet Office by whom. Are these ‘saving’s or ‘efficiencies’? The wording of the Press Release, and especially Francis Maude’s comments, suggest these are efficiencies that won’t affect ‘frontline’ services. This is, of course, tosh. ‘Efficiency’ has a strict technical definition – it is the ratio between inputs (the costs of doing stuff) and outputs (what gets produced or delivered). The problem has always been for public services that because they are ‘free’ at the point of delivery (in most cases) we don’t have a ready measure of output. In recent years the Office of National Statistics (ONS) had sought to address this problem, but only for some public services. So when a cut to inputs (costs) is made it is often very difficult to tell if this leads to improved efficiency improvements or not because we can’t measure what is produced. What are listed in the “Staggering” Press Release are just figures for cuts in spending on various things – we have no idea whether these are efficiencies or not. This government has made much less effort than their predecessors to spell this out. The truth is that in most cases they are just plain old cuts. These may well be justified – some public programmes are almost certainly not justified – but there is no effort by the Government to present any analysis, cost-benefit studies, or anything else to justify their decisions. ← Public Service: Mutually Assured Destruction? I wonder how the “Murdock Press” will report these remarkable re-balancings.